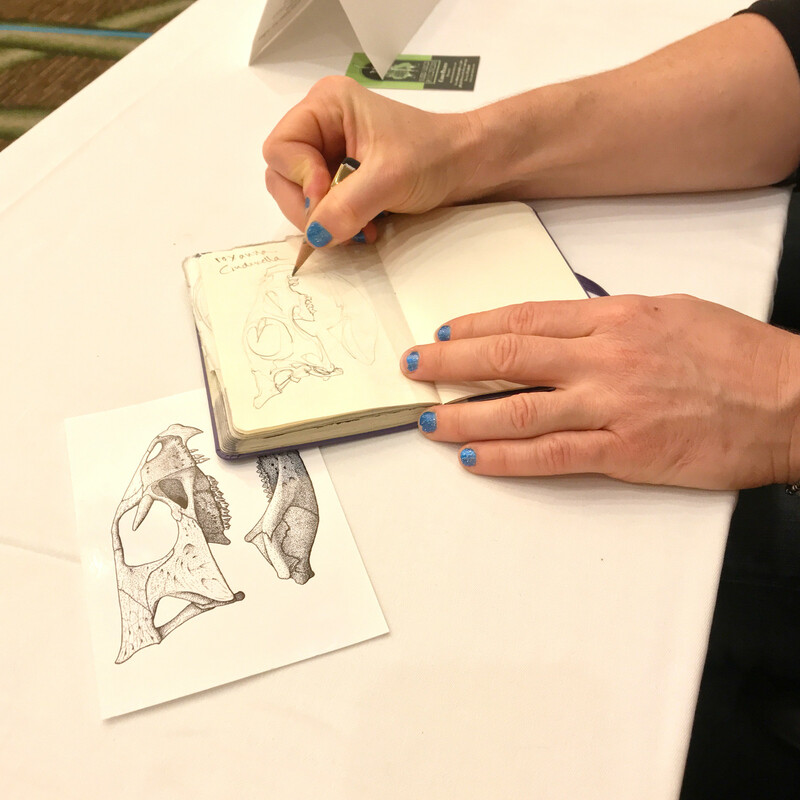 So, here’s a cool thing that happened at Norwescon. On Saturday afternoon, there was an autograph signing session. Probably to the surprise of no-one, a lot more people were interested in having things signed by the other two guests of honor, Galen Dara and Ken Liu, than by me. But happily I was situated between them so I coasted a bit on the interest they drew. There was quite a bit of downtime in the two-hour session, so I had the chance to chat with both Galen and Ken. That was actually a highlight of the con for me – I was hoping for a chance to get to know my fellow guests of honor a bit, instead of just passing them in the hallways as we all went off to our separate scheduled activities. 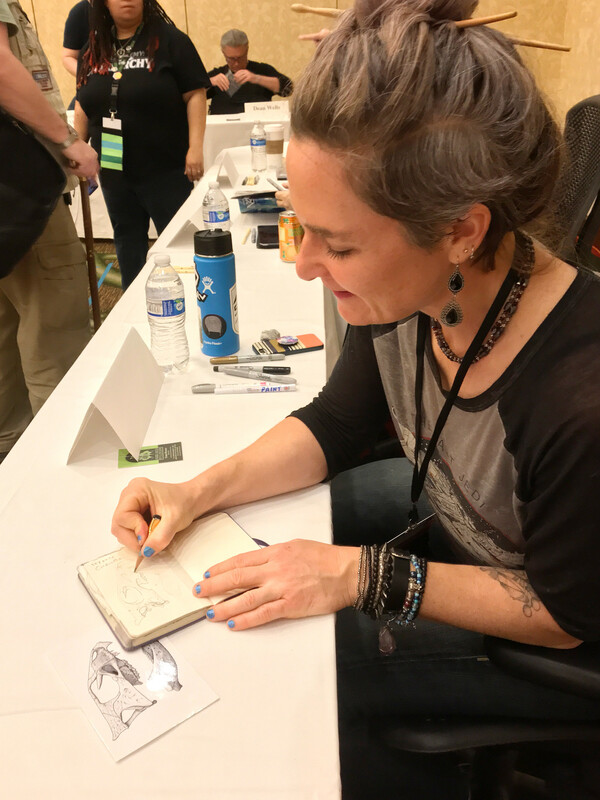 Whenever Galen Dara wasn’t signing autographs, she was drawing. Makes sense, right? You probably don’t get to be as professionally successful as she is if making art isn’t compulsive. And it was just my luck that the proximate cool thing around to draw was the skull of Aquilops – I was signing prints of my skull recon, and I had along the reconstructed cast skull that I use for education and outreach. So I had the fairly trippy experience of watching an award-winning artist at the top of her game draw ‘my’ critter. As you can see from Galen’s Instagram, she draws and paints a lot of skulls, and she spends a lot of time exploring the geometric underpinnings of skulls. She warned me at the outset that her Aquilops skull would be more impressionistic than photo-realistic – her interpretation of Aquilops as organic art. I think it looks pretty great; I have to trace stuff to get the proportions that close on the first go. And as I recently mentioned in another post, it’s always mesmerizing for me to see how a visual artist can conjure form, weight, and texture one pencil-stroke at a time. Many thanks to Galen for permission to post these pics, and for her interest in my favorite non-sauropod.